This review is written with a GPL 3.0 license and the rights contained therein shall supersede all TOS by any and all websites in regards to copying and sharing without proper authorization and permissions. Crossposted at Bookstooge.booklikes.blogspot.wordpress.leafmarks.com & Bookstooge's Reviews on the Road Facebook Group by Bookstooge's Exalted Permission. Mr Genius wakes up one day to find that he, supposedly exempt from the Death Lottery since he's a bigshot in The Dome, has been chosen to die. Escaping the Dome, Mr Genius finds out that everything he's been told is a lie and the Dome isn't quite the Utopia it is supposed to be. 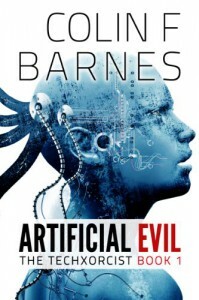 Fighting an evil A.I while trying to survive in a brand new world, Mr.Genius leads us on fast paced adventure. Barnes really did copy the outlines of this story from Shirow Masamune. The Dome/Utopia is straight from Appleseed, the A.I. 's from Ghost in the Shell. Frenetic is the best word I can think of to describe this. I was as lost and confused as the main character for most of the book. The techno-babble wasn't necessary and added nothing to the story except to let us know that the author "was an expert". The supposed "revelation" about the nature of Mr Genius was not much of a revelation if you've watched/read the anime/manga I mentioned above. It was a real non-starter for me. Finally, the ending. The ever-hating cliffhanger. Mr Genius is returning to the earth on a spaceship and it has been messed with, so we end the story with him jetting off into space. No more Colin Barnes for me.